The Open Interdojo Seminar is an opportunity for aikidokas from different clubs and groups to practice together. 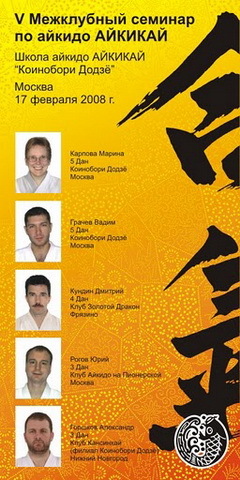 Its major objective is to facilitate mutual understanding and unity among Russian aikido organizations. With this in mind, we strive to avoid pressures at the seminar and create an atmosphere of everyday practice. Every year we invite instructors from various aikido organizations to conduct the seminar and encourage the participants to practice from representatives of unfamiliar dojos. The seminar is conducted every year since 2003, in the form of a 2-hour-long practice directed in turn by instructors from several Russian aikido AIKIKAI dojos. After the practice we hold unofficial demonstrations by instructors participating in the seminar. The seminar usually draws 120-150 participants, mostly from Moscow, Western and Central Russia. Moscow, Domodedovo, Fryazino, Izhevsk (Udmurtia), Mytischi, Nizhny Novgorod, Obninsk, Pskov, Puschino, Pushkino, Smolensk, Stupino, Tambov, Velikie Luki, Vilnius (Lithuania), etc.